• 100% "detergent free" clean fabrics. • Toxin free laundry room. 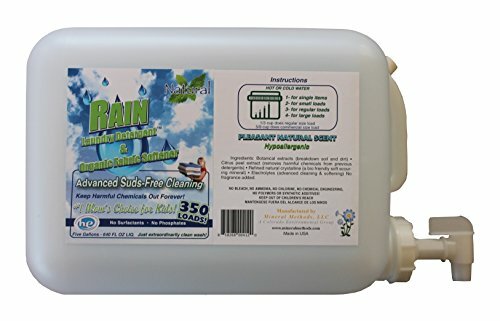 Rain Laundry Detergent + natural softener provides the world's only true 100% detergent-free single rinse. Regardless of whether Rain is overused in the washer or not, no need to second rinse. Fabrics washed in Rain, will always rinse 100% free of any detergent residue. This cleansing agent plus silky softening, was originally developed for the newborn baby, though being an all-natural Bio-symmetric solution, it is exceptional for the whole family. Bio-symmetric science shows the interactive Hypersensitive Foliage Reactor (SAR), is a stand-out molecule inherent in plants, which naturally target resistant bacteria. Comprised of enriched extracts, Rain's advanced organic solution effortlessly elevates everyday skin care. For more on this google: hypersensitive foliage response Wikipedia. The world's only DETERGENT FREE FABRIC CLEANER. New advanced "SUDS-FREE" cleaning, is 100% free of any soap chemicals or fragrance. Family care and newborn rash guard. Rain is also softener free, yet Rain's organic cleaning renders natural homemade softness. Never again sleep in linens carrying detergent dust. For more on Rain's baby soft hygienic formula, google: hypersensitive foliage response Wikipedia. Having a detergent-free rinse, vulnerable sweat glands are safe from caustic residue. After bathing, skin pores are wide open; use a bath towel free of detergent or softener chemicals. RAIN INGREDIENTS: Molecule selective extracts (breakdown soil and dirt). Cold-press fruit protein (helps neutralize previous detergent chemicals). Natural mined crystalline (a bio-friendly cleansing mineral) • Organic grain electrolytes (enhanced cleaning & softening). Remove fabrics from washer promptly and dry completely. Rain contains NO stain remover chemicals. Such agents often lodge in clothing and may enter a person by normal skin or gland absorption. For most fabrics, Rain also "reduces" stadic cling. Static cling occurs for different reasons, yet is often due to a contaminated washing machine. google: "itk1 internal washing machine cleaner". If you have any questions about this product by Mineral Methods, contact us by completing and submitting the form below. If you are looking for a specif part number, please include it with your message. Seventh Generation Geranium Blossoms and Vanilla 4x Laundry Detergent Liquid, 50 Ounce -- 6 per case.